Although I'm not a fanatic of the progressive metal scene, there are a handful of bands in the scene that interest me, Time Machine being one of those. Italy based Time Machine have been churning out music since 1993's debut EP, Project: Time Scanning. 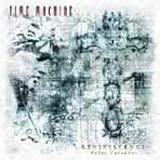 Reviviscence is a concept album based upon the ancient tale of good versus evil. The songs deal with topics such as greed, war, corruption, and the young hopefuls of the world seeking to make this world a better place. Vocalist Pino Tozzi has been replaced by Marco Sivo. After an intro, the album gets going with Rotten Souls, a double bass driven prog/power metal cut, probably the heaviest song of the album. From this point on out, the guys really vary the songwriting quite nicely. After listening to this album, I think you will agree that Time Machine are great songwriters and musicians, yet they don't need to indulge themselves in "musical masturbation" to prove it. Furthermore, they don't need to change keys or time every 15 seconds. One thing I hate is a prog album that dives off on endless tangents, ultimately losing my interest and attention. While there are times when the guitarists swoop and Yngwie-ish shred out of their pocket, it still manages to fit within the scope of the song structure. As this album deals with good and evil, plenty of the material on this album is engulfed in a dark atmosphere. Angel Lucifer, Tears of Jerusalem, and Grains of Sand are prime examples of this. Aside from Rotten Souls, Seeds of Revelation, and the closing track, Revelation, the remainder of this album falls into the mid tempo category for the most part. That does not detract from the quality of the songs however. Sharp riffs (accentuated by the tight and crisp production), and heavy, yet diversified drum beats prevent the songs from becoming dull or predictable. Well placed synthesizers and keyboards provide a rich, but not overbearing atmosphere for the album. Time Machine use these elements to enhance the few upbeat moments on the album, but album do a great job in making the more predominant gloomy moments just a little more dark. The more adventurous tracks of the disc, Alhambra, Tears of Jerusalem, and Seeds of Revolution are found on the second half of the album. Alhambra builds into Tears of Jerusalem with only acoustic guitars that form a perfect, highly expressive build up. With its use of the sitar, Tears of Jeruslam is one the most epic, if not most expressive track on the disc. Seeds of Revolution nearly matches Rotten Souls and Revelation in heaviness, but the mandolin meshing with outbursts of guitar solos is just something to remember! Some light use of the synth and some well placed keyboards perfectly augment the energetic and methodical nature of this song. This is one album that should be listened to in its entirety. Sure, a lot of albums slowly (or quickly) decline in quality as the album draws to a close, but some of the most fascinating and intriguing ideas of Reviviscence are found on the second half. I have just a few more comments on the vocals and other aspects of the music. First of all, let me say that Marco Sivo does a fine job on his first Time Machine album. His vocal delivery is very smooth and melodic, and he sings with conviction. There are times when it seems like he is a bit too subdued, however. On the other hand, his vocals help the band establish many well defined, and memorable melodies throughout the album. The melodic quality of this album is one that is not over the top or addicting, but it is enough to give the songs some character and personality. In other words, they are just one of many elements of Time Machine's sound that blends in well with the other elements that I have previously discussed. The vocals of Marco Sivo are just as important as the melodic quality of the album, the intricate drumming, the diverse instrumentation, and the shining guitar solos as ingredients to great songs. Furthermore, the lyrical content is very much worth listening to as the themes are very applicable to today's world. Time Machine ability to write and perform quality material will keep me a fan of the band. Without falling into the trap of writing a song to show off a virtuoso guitar solo, or to show how smart the band is by writing a confusing song with 57 different time changes, Time Machine just deliver an excellent prog metal album. Fans of the band will certainly appreciate this album, as will the general prog fan. Furthermore, I would encourage anyone who usually avoids prog metal for some of the aforementioned reasons to check out this album.